The HEPA air filter is the air purifier industry standard, although air filtration with technologies other than HEPA is selling well. I advocate, with reservations detailed below, quality HEPA air filtration and heavy carbon gas cartridge, as the central components of every air purifier. HEPA is an efficiency standard for air filters, not a brand name or type of filter construction. True-HEPA filters are primarily folded paper elements with fiber reinforcing, but too many consumers believe that HEPA is synonymous with paper filter. Many paper filters which do NOT perform at HEPA are sold under various forms of the "HEPA" name (HEPA-type actually means NOT-HEPA). HEPA air filter technology was developed for the Atomic Energy Commission as a way to remove radioactive particles from reactor environments. It has been adapted to clean rooms in semiconductor, hard disk, and pharmaceutical manufacturing, as well as hospital surgical theaters. The HEPA air filter, where properly deployed, has a track record of safety and effectiveness. This filter is based on ultra-fine glass fibers molded into paper with very small pores, which is folded in pleats to maximize surface area. HEPA air filtration can trap very tiny particles as air is forced through. These small airborne particles are measured in microns. A micron is one millionth of a meter, 39 millionths of an inch. The naked human eye can just see particles 35 microns in size. A human hair is about 100 microns in diameter. A human cell is typically several microns wide, much larger than the smallest particles. To qualify as HEPA, the filter must remove 99.97% of particles down to 0.3 microns from air that passes through it. First, notice that the specification did NOT say "HEPA cannot retain particles smaller than .3 micron". Three tenths micron is the most penetrating particle size, other particles are retained even better. A HEPA filter is NOT a sieve, with tiny pores, it is a mat of fibers which intercept flying particles through different processes. The gaps between fibers are much larger than the particles caught. Think of trying to ride a fast motorcycle through a deep forest, go far enough and your bike will have a high probability of hitting a tree. But this technicality has opened a big hole for marketers, many of whom fail to understand it. True HEPAs do NOT filter particulate "down to .3 microns," and the ability to retain particulate at .1 micron is not, of itself, evidence of superiority. Purifier efficiency is the percentage of particles in a given size class extracted from the air passing through the purifier. So efficient HEPA air filters, which are not that expensive, can be packaged in cheap material to create a mass market "HEPA air purifier". Many vendors claim high efficiencies for their air filters, but few HEPA air purifiers have high efficiencies as a whole. A powerful fan must force air through the filter, creating a pressure difference on the intake side. We feel this backpressure release as the air, and noise, rushes out into the room. Many a HEPA air purifier fails to produce promised performance. A principal cause is ill-fitting housings and poor quality gaskets which allow air to leak past the filter media. Air leakage is called bypassing. When the media accumulates enough particles, resistance increases the internal backpressure. In poorly sealed and gasketed air filtering systems, the increased internal air pressure will force contaminated air to squeeze through cracks around the filter media, and spew un-filtered air back into the room. To most consumers, and many air purifier experts, this doesn’t seem like much of a problem. Inexpensive air purifiers become selective filters for larger airborne particles. Bypassing particles have already been screened by the prefilter and squeezed through tiny cracks filled with trapped dust, they are by definition the smallest. These tiny flakes can suspend permenantly in the air. The air looks clean, major dust builds up on the prefilter, the main HEPA filter turns gray like it’s supposed to, and the consumer feels satisfied. But dangerous fine particles are not removed from the air. I have made this mistake for over 25 years, fussing over the cost of HEPA air filter replacements like everybody else. Now I consider my cheaper air purifiers a bunch of stationary vacuum cleaners! A reminder; super fine particles in air are the most hazardous to our health, penetrating the body's defense mechanisms, going through the lungs into the blood stream and even penetrating cells. These superfine particles increase the systemic inflammation behind many illnesses. Superfines join other extracellular debris adorning exterior surfaces of our cells, masking the flags that identify cells as “self” to the immune system. Could this be a contributing cause of allergy, asthma, MCS, and autoimmune diseases? Could they also interfere with the cell's inner machinery and cause cancer? I'm not waiting to find out. Fine particles coat an inefficient air purifiers’ internal surfaces and exhaust passages, making the air cleaner itself a repository of the finest lung penetrators! After about a year, stand back when you turn them on. Invisible smoke grenade! 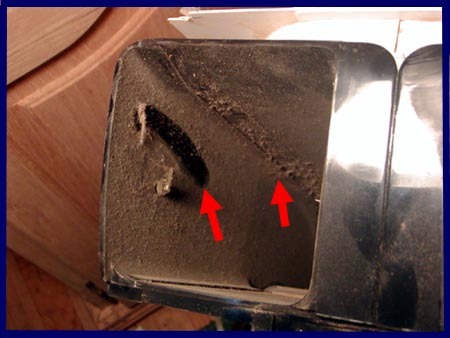 Particle accumulation can occur in leaky True-HEPA air cleaners as well as most HEPA-Type setups. Run it, run it long and hard, ride it into the ground like a 15 year old kid on a old dirt bike. Then take it apart and look inside. This HEPA air cleaner ran continuously in my living room from 1988 to 1993, when it developed vibrations and then quit. My wife remembered it, stashed in the attic, when I started this website. On the right: with the plastic case removed, the red arrows represent "clean" filtered air, which has supposedly passed through the air filter, entering the metal exhaust duct. The blue arrows represent the same air exiting the air cleaner. Everything seems fine until you peer into the exhaust air outlet with a flashlight. "If you don't want to party, you'd best not come in here." The red arrows above point to accumulated fine dust in the exhaust outlet. That is a finger smudge revealing the formerly clean surface. Yikes! What HEPA filter? This looks like the inside of a central HVAC air duct! I clean the mess with wet paper towels and vacuum, taking pride in a job well done (wrong). Then find and fix the spot where the squirrel cage fan has dragged against the duct, causing the vibration. I clean and replace the plastic case, vac and replace the HEPA filter and seal every crack with plastic tape. The prefilter is washed, dried, its edges sealed with tape, and the outer grill snaps back in. Ready for liftoff? Power on and see spot run! I am real pleased with myself for about 10 minutes. Then I realize my eyes and nose are starting to itch. Even after my cleaning there are still fine particles in the air coming from the exhaust port. They are down inside the motor where I couldn't reach. No way can this thing be considered a HEPA filter air purifier. After another dis-assembly and flushing with a powerful compressed air jet, the old Sunbeam is still running, it keeps bigger particles out of my real air purifiers. More recently, I wash out the contamination with a garden hose. Quality HEPA air purifier builders seal and gasket their filter media for no-bypass high efficiency. Since 90%, by numbers, not weight, of all particles are smaller than 0.3 microns, it is critical that HEPA air purifiers perform at that minimum standard. I recommend only those air cleaners with gasketed and sealed systems enclosing a certified true HEPA filter. The HEPA filter is measured in square feet, prior to folding. But design, manufacturing quality control and handling can play a role. The delicate folds must pleat perfectly without sharp bends where cracks can form. Big filters might be 80 sq. ft., above 50 is good: size does matter. Many products that use HEPA filters provide a small amount of filter surface area, requiring frequent changes. High maintenance can be costly, time consuming and inconvenient, leading to consumer neglect. Air filters should be labeled as "true HEPA" or "medical grade HEPA", and not “HEPA-type”. This business loves to confuse customers with look alike buzzwords such as "99%" and "Microfiltration": don’t be fooled by jargon. It is not uncommon to find packaging which features the HEPA label in large letters to confuse consumers as to the actual brand and technology level inside. Systems with enough fan power to push a well sealed system are going to be noisy on high speed: up to 70 dBa.(decibels). Chemical fumes, gases, finer parts of smoke, odors, viruses, and some bacteria will go right through a HEPA machine. This is why the second building block must be an "expensive" heavy carbon VOC canister. Outgassing can occur from silicone used for gaskets and glues that attach the filters to the housing. There are special MCS purifiers, for people with multiple chemical sensitivities, which avoid this problem. Please do not think I have badmouthed HEPA filter air purifiers here. When combined with serious VOC chemical filtering capacity, the HEPA filter is a basic building block for the best health promoting air cleaning system.